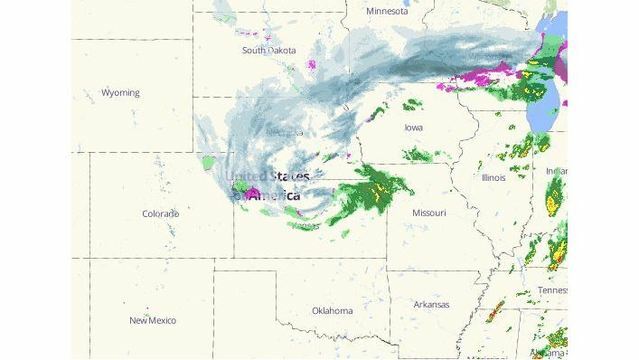 TOPEKA, Kan. (RELEASE) - The Kansas Division of Emergency Management activated the State Emergency Operations Center in Topeka to a partial level at 6 a.m. today to monitor a winter storm system that moved into Northwest and North Central Kansas in the early hours of Saturday. KDEM staff and representatives of key state emergency response agencies will remain on duty throughout the day to receive any calls from assistance from counties affected by the winter storm. Kansans are urged to change or delay their travel plans in these areas until the storm moves through. Winter road conditions are accessible by dialing 5-1-1 from your mobile phone anywhere in Kansas; outside Kansas call 1-866-511-5368 (KDOT). Road conditions many also be viewed on the Kansas Department of Transportation web site at http://kandrive.org. Outdoor pets are especially vulnerable to bitter cold and extreme wind chills. Bring outdoor pets inside if possible or ensure that they have a draft-free enclosure with straw-type bedding that is large enough for your pets to lie down, but small enough to hold in body heat if they must remain outside. Always make sure that your pets have access to food and non-frozen water. For additional pet safety information, go to www.avma.org or https://www.aspca.org/pet-care/general-pet-care/cold-weather-safety-tips.